Perhaps the most striking evidence of injustice lingers in the hallways of our public schools, where 70% of African American males are expected to drop out before graduating high school. This harrowing statistic puts Pinellas County on the national map, neck-and-neck with cities like Chicago and Milwaukee. As citizens of this remarkable community, we must commit ourselves to awareness. But, what exactly do we do with this piece of information? How can we combat inequities lying just blocks to our South? Well, the answer I’ve come to embrace is this one: food. My belief in food as a powerful tool for reshaping our community – the global community included – is the handiwork of Dr. Kip Curtis, environmental historian, Eckerd College professor, and founder and executive director of the Edible Peace Patch Project. The Edible Peace Patch Project is a local nonprofit organization working to chip away at the detrimental impacts of poverty in South St. Pete. Their tool of choice? A schoolyard garden. 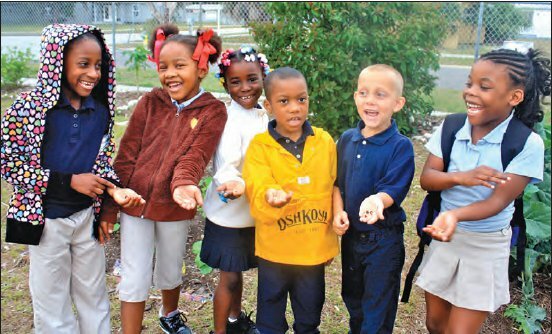 Since its inception in 2009, the Edible Peace Patch has cultivated organic vegetable gardens in four Title I elementary schools. These are all schools were 65% or more of the students receive free or reduced lunches, a statistic that serves as an indicator of poverty. “What ends up creating a cycle of poverty is hopelessness, a sense that there is no future, there is no way to control it,” argues Curtis. The Peace Patch addresses these social justice concerns while also introducing a sustainable alternative for food production and dietary health. The project implements an experiential educational program that places Eckerd College students with elementary schoolchildren. The end goal is to foster circumstances for a higher success rate among these at-risk kids. The concept of food is unique in its capacity to integrate a myriad of movements – human and ecological health, social discrimination, economic inequality, community development and cultural continuity. As corporate agribusiness reigns over this unsustainable, globalized food system, people grow ever divorced from the land and from what they eat. The food justice movement now stands as a pivotal platform from which we may address many of the unsustainable aspects of our current broken system. Food remains our most intimate lasting connection to the land. It holds great potential to revolutionize our relationship with the environment, as well as with each other. It comes as no surprise issues of food access and quality hit hardest on the poorest. Though we often think of underdeveloped nations where food is scarce and malnutrition is rampant, there are serious problems with the food system in our own backyard. Much of St. Pete’s Southside is considered a “food desert,” a term used by the USDA to describe a geographic area with little or no access to fresh and affordable foods. Not long after Curtis mentioned his youth growing up on a sustainable farm to an environmental history class at Eckerd, barefoot coeds began banging on his door rallying their professor to share with them his organic gardening repertoire. And, although Curtis’s childhood left him void of any romantic notions of the bucolic lifestyle, he saw an opportunity to create the kind of empirical classroom in which Eckerd students do their best. “They essentially dragged me, kicking and screaming, back into farming and agriculture,” admits Curtis. 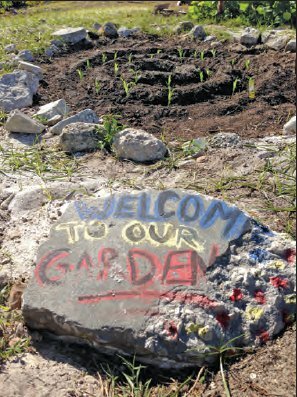 A group of about 19 Eckerd students wound up on the school grounds of Lakewood Elementary, home to the first of now four Peace Patch gardens. At the time, it was also the alma mater of Curtis’s two kids. His experience as an involved parent and treasurer of the PTA gave him sound insights into the issues facing low-income communities in our town. And so the program came full circle: out of this agricultural drive expressed by a small class of Eckerd students came a novel experiment for social justice – an experiment whose name was imagined by a class of Lakewood fourth graders. And so the Edible Peace Patch Project came into being. Many Eckerd students initially sign on to volunteer for the Peace Patch out of an interest in sustainable, organic food production.